C. A. 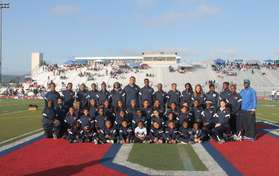 Track Club (CATC) is a non-profit youth track and field team based in Oakland, California that serves the Bay Area's youth in competitive and recreational sports. The club is a member of the USA Track and Field Pacific Association (USATF), as well as the Amateur Athletic Union (AAU), and participates in meets locally, state-wide, and nationally. CATC consists of about 75 student-athletes that range in age from 4-18. CATC's goals are to encourage and help our youth to develop physically through team practices and meets, emotionally through growth and positive self-image, and socially through the development of friendships and interaction with positive adult role models. The budgetary funds for CATC are based solely on membership dues, fundraising, and donations. Do you want to be stronger? Do you want to be faster? 2018 CATC Track Season Registration IS NOW OPEN!!!! Uniform Package will be separately purchased/ordered by each team member. The CATC Sweatsuit, Pullover Sweatshirt, Socks and Hats ALL optional purchases and prices - are located on the site. Please place uniform order on or before February 28, 2018. Store will close after this date.